December is the twelfth and final month of the year in the Julian and Gregorian Calendars and is the seventh and last of seven months to have a length of 31 days. It got its name from the Latin word decem (meaning ten) because it was originally the tenth month of the year in the Roman calendar, which began in March. The winter days following December were not included as part of any month. Later, the months of January and February were created out of the monthless period and added to the beginning of the calendar, but December retained its name. December contains the winter solstice in the Northern Hemisphere, the day with the fewest daylight hours, and the summer solstice in the Southern Hemisphere, the day with the most daylight hours (excluding polar regions in both cases). In the Orthodox Church, the month of December is primarily centered around Christmas, which is the celebration of the Nativity of our Lord on December 25th. This is reflected not only in the calendar of the Church, but also in its hymnography. Beginning with the feast of the Entrance of the Theotokos into the Temple on November 21st, the nine Irmoi of the Christmas Matins Canon (Christ is born! Glorify Him!) begins to be chanted in the churches. Furthermore, the Nativity forty day fast began on November 15th, which is preparing us to receive the eternal God-man born in a manger. Though this fast begins rather lenient compared with Great Lent, seven days prior to Christmas, beginning on December 18th, it becomes stricter when fish, oil and wine are no longer permitted until Christmas day. We begin the month of December by celebrating the memory of certain Old Testament Prophets who foretold the coming in the flesh of Christ the Savior. Thus we commemorate the Prophet Nahum on December 1, the Prophet Habakkuk on December 2, and the Prophet Zephaniah on December 3. Besides these three to start the month, we also have two prophets in the middle of the month as we get closer to the Nativity, with the Prophet Haggai on December 16 and the Prophet Daniel and the Holy Three Children on December 17. By commemorating these Prophets before the Nativity of Christ, we are being reminded that the event we will celebrate on December 25th was foretold hundreds of years before the event. In fact, the Prophet Daniel even foretold the year in which Christ was to be crucified with his Prophecy of Seventy Weeks around five hundred years before it happened. Besides commemorating certain Prophets on specific days prior to the Nativity of Christ, the Church also sets aside the two Sundays before the Nativity of Christ to commemorate all the Saints prior to His birth. Thus, on the Sunday that occurs on or immediately after the eleventh of this month, we commemorate Christ's forefathers according to the flesh, both those that came before the Law, and those that lived after the giving of the Law. Special commemoration is made of the Patriarch Abraham, to whom the promise was first given, when God said to him, "By your seed shall all the nations of the earth be blessed" (Gen. 22:18). This promise was given some two thousand years before Christ, when Abraham was seventy-five years of age. 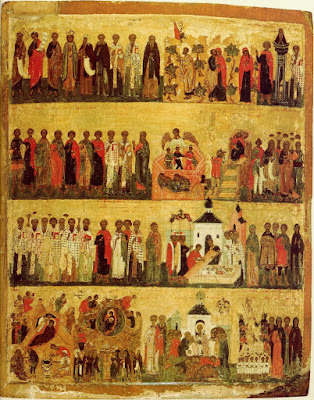 Then, on the Sunday that occurs on or immediately after the eighteenth of December, we celebrate all those who from ages past have been well-pleasing to God, beginning from Adam even unto Joseph the Betrothed of the Most Holy Theotokos, according to genealogy, as the Evangelist Luke has recorded historically (Luke 3:23-38) as well as the Evangelist Matthew (Matthew 1:1-17); we also commemorate the Prophets and Prophetesses, and especially the Prophet Daniel and the Holy Three Children. December 20th begins the Forefeast of the Nativity. The liturgical structure is similar to the Holy Week preceding Pascha, where more emphasis is placed on prophetic readings and reflective hymns. The Orthodox Church sees the birth of the Son of God as the beginning of the saving ministry which will lead Him, for the sake of man’s salvation, to the ultimate sacrifice of the Cross and the defeat of the sting of death by His glorious Resurrection. On the eve of the Nativity, December 24th, the Royal Hours are read and the Divine Liturgy of Saint Basil the Great is served with Vespers. At these services the Old Testament prophecies of Christ's birth are chanted. The Vigil of Christmas begins with Great Compline because Vespers has already been served. At Compline there is the singing of the Troparion and Kontakion of the feast with special hymns glorifying the Saviour's birth. The order of Matins is that of a great feast. Here, for the first time, the full Canon "Christ is born," is sung while the faithful venerate the Nativity icon. Concluding the celebration of the Nativity of Christ is the Liturgy. It begins with psalms of glorification and praise instead of the three normal Antiphons. The troparion and kontakion mark the entrance with the Book of the Gospels. The baptismal line from Galatians 3:27 once again replaces the Thrice-Holy. The Epistle reading is from Galatians 4:4-7, the Gospel reading is the familiar Christmas story from Matthew (2:1-12), and then the Divine Liturgy continues in the normal fashion. After the Nativity of Christ on December 25th, there begins what is commonly known as the Twelve Days of Christmas which lead us to the Feast of the Theophany on January 6th. Thus, on the first day, December 26th, we celebrate the Synaxis of the Theotokos, since without her the Nativity of Christ would not be possible, together with the Flight into Egypt. On the second day, December 27th, we celebrate Saint Stephen the Protomartyr, who is the first-fruits of the martyrs of Christ after the Resurrection. The 20,000 Martyrs of Nicomendia are commemorated on the third day because they were martyred on the feast of the Nativity, and on the same day we commemorate Saint Simon the Myrrhgusher who founded Simonopetra Monastery on Mount Athos, which he dedicated to the Nativity of Christ after it was indicated to him in a divine vision. On the fourth day we commemorate the 14,000 Infants Slain by Herod, who are the first-fruits of the martyrs of Christ before the Resurrection. Finally, the Leavetaking (Apodosis) of Christmas is celebrated on December 31st, the day before the secular New Year as well the Feast of the Circumcision of Christ. Furthermore, on the Sunday After the Nativity of Christ, we have a special commemoration of three men closely associated with the Nativity of Christ - Joseph the Betrothed, James the Brother of God and David the King and Prophet. James was the son of Joseph from a previous marriage and helped in the Nativity of Christ as well as the Flight into Egypt, while David is one of the forefathers of Christ in the flesh. Besides all these days in the month of December devoted to preparing and celebrating the birth of Christ, we also have a special feast day on December 9th celebrating the wondrous Conception of Saint Anna, the mother of the Most Holy Theotokos. The reason this feast falls in the middle of the preparations for the feast of the Nativity of Christ is because on September 8th we celebrate the Nativity of the Theotokos, who was conceived nine months prior, on December 9th. Therefore on December 9th we have an additional opportunity to celebrate the Mother of God, as well as her parents Joachim and Anna, without whom the Nativity of Christ and the salvation of the human race would not be possible. 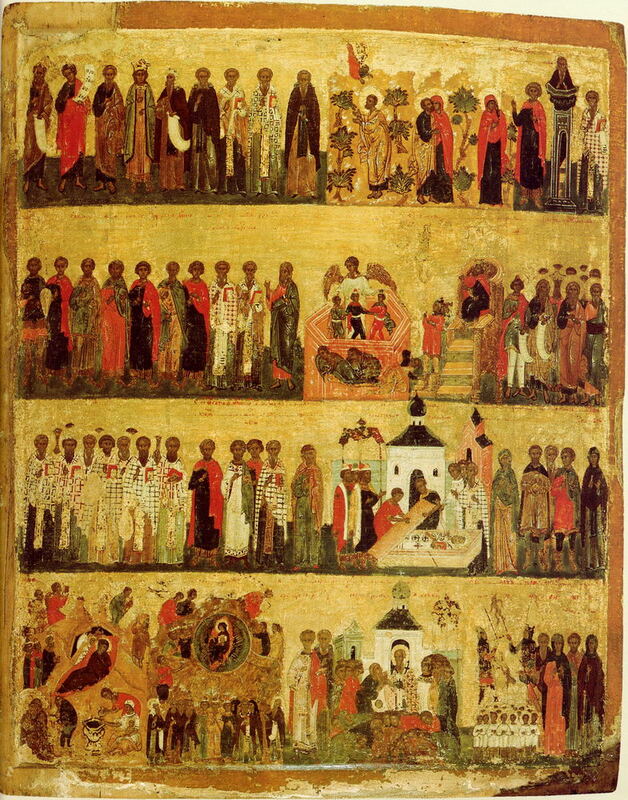 In addition to this, the month of December also gives us an opportunity to celebrate many great and beloved saints of the Church, among whom are the following: Barbara on December 4, John of Damascus on December 4, Savvas the Sanctified on December 5, Nicholas of Myra on December 6, Ambrose of Milan on December 7, Patapios on December 8, Daniel the Stylite on December 11, Spyridon the Wonderworker on December 12, Eleutherios on December 15, Dionysios of Zakynthos on December 17, Sebastian on December 18, Ignatius of Antioch on December 20, Juliana on December 21, Anastasia the Pharmakolytria on December 22, and Eugenia on December 24. These imitators of Christ serve as models for us of what it is like to live a life focused on Christ, and the glory that awaits those who do so. Thus, the month of December is among the richest months of the Orthodox Christian year, with practically non-stop feasting and fasting. In the cold darkness of the winter months the light of Christ, who is the Sun of Righteousness, shines ever so bright, bringing joy and gladness to all the faithful. May we also journey with the Magi, who were guided by a star, to worship the new-born King of kings, and offer him the gifts of our lives.